Do you live in one of the few lucky homes that DOES NOT have a copy of the The Complete Adventures of Curious George ? Are you a parent of an incredibly fortunate pre-schooler that has never (yet) listened to a Curious George story? I say this... because you are in for a real treat. This treasury is the Koh-i-Noor of read-alouds. And as any great diamond, Curious George is still highly sought after. Still, the good news is that this treasury - despite its enormous value - is readily available in your favourite bookstore or at your nearest library. And you can get it as a hardback or a kindle ebook edition. It has been said that whoever owned the Koh-I-Noor diamond ruled the world, and I feel it is a fitting analogy for this treasury. The Complete Adventures of Curious George will help your pre-schoolers embark on the voyage of literacy, which that will help them "rule the world" one day. 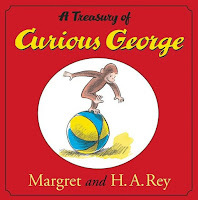 First things first, this - The Complete Adventures of Curious George (yellow cover) - is the treasury with all the ORIGINAL stories penned by Margret and H.A. Rey. Let's be clear. There are other Curious George treasuries on sale as well, but those are not original stories authored by the original creators of Curious George. Are the other Curious George treasuries any good, you ask? My kids also adore the two other Curious George treasuries that are available - and I love them as well. The treasuries of the new (post-Rey) Curious George stories are very faithful to the original Rey stories both in terms of story-telling and in artistic merit. So, my kids do not see any difference in the quality/style of the original treasury and the new stories. Both of these hardcover volumes are smashing with equally interesting stories, but anyhow I would recommend that you start with the Reys' original The Complete Adventures of Curious George , as they will introduce the two principal characters and "sprinkle your kids with the Reys magic" that will help the other stories to work. The character of Curious George is a simple, yet smashing creation. 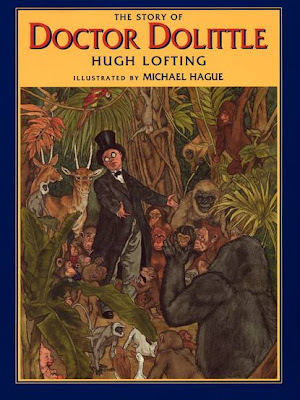 Kids identify so easily with a little curious monkey who never lived in a town (he was discovered in the African jungle by explorer The Man in the Yellow Hat) and wants to explore EVERYTHING. If you are looking for the first stepping stone from board books to "real books", look no further. Lest I forget, I must say that the Curious George books would be unimaginable without his friend extraordinaire and über famous The Man in the Yellow Hat. He remains nameless throughout the treasury, but always appears at the beginning and the end of the stories ... like a benevolent parent. One of the principal things that readers and listeners simply adore about these stories is the fact that when you start reading... you really never have an idea where will they take you. 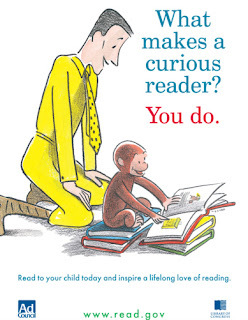 Curious George is a great literacy advocate too! ﻿This sets you and your little listener in a comfortable mood... before monkey mayhem ensues. Curiosity takes hold of Curious George, usually at a moment when the Man with the Yellow Hat leaves him somewhere alone for a minute or longer. If you think this is a mere picture book treasury, you are wrong. There is more than meets the eye. Your kids will have an unforgettable eperience with the original Curious George stories penned by Hans Augusto Rey and Margret Rey, a husband and wife pair of wartime refugees from Nazi Germany. The Reys met and married - where else than in ... Rio de Janeiro in 1935. 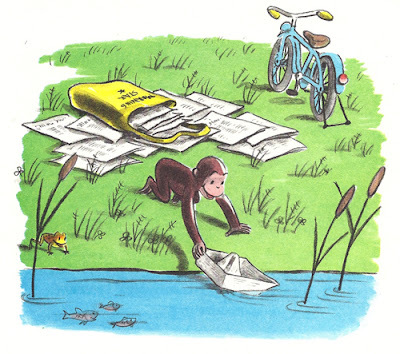 Interestingly, the manuscript for the first Curious George books was one of the few items the Reys carried with them on their bicycles when they escaped from Paris in 1940. B. Parents can also rejoice - this treasury is a rare feat of publishing in the world of children's picture books as it also contains some very involving material for parents, aside from the stories. 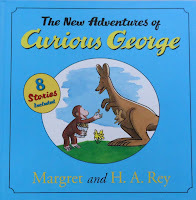 First, there is an exceptionally involving introduction on the history of Curious George by Leonard S. Marcus. For example, did you know that the first British edition of Curious George was published under the name Zozo - because the reigning king was George and curious in 1940s Britain meant "gay") ? Seond, we also get some truly fabulous historical insight (A Publishers Perspective) from the one and only Anita Silvey on the realities of the publishing world for children's books in 1941 when Curious George officially disembarked in America. If you have never visited Anita Silvey's incomparable Children's Book-A-Day Almanac you must check it out! Since I discovered this treasure chest of information on the best children's books, it is a rare day when I do not read the Alamanac. (And if I do skip a day, I make it up by searching for the books that were recommended on the days I missed). I was astounded to find out in Anita Silvey's "A Publisher's Perspective" that Curious George sold "negative-six" copies in 1945, as bookstores returned more than they bought that year! There is also a very personal and touching story about Margaret Rey from Anita's personal perspective. Don't miss it! Finally, at the end of this treasury, you will also find an extremely intresting Retrospective Essay by Dee Jones with a Photographic Albuym of the Reys. This essay includes photographs of their early work, advertising work, New Year's Cards, other artwork and photographs from their personal album. What a package this treasury! However, I have to "warn you". Despite all the accolades, there are some "dangers". 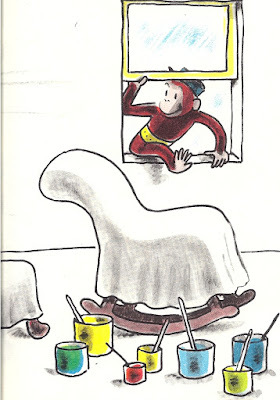 Namely, Curious George keeps getting into trouble for being "too curious". So.... let me quote an exchange that I recently had with my 3 1/2 year old son, while we were reading the The Complete Adventures of Curious George. "Dad, what is curious?" said my nosy little pumpkin. "Well, YOU are curious. You love to learn new things," I told him. "Noooooooooo! Noooo! I'm NOT curious". My son got offended when I grouped him together with Curious George. I do understand him. When he looks at Curious George he probably sees instead a somewhat "Naughty George". Since then, I explained to him that curious is in fact a very nice character trait. Yet, my twins reject any possibility that they are curious, preferring instead to laugh at Curious George's escapades together with me. Curious George is now practically family and my kids love him to bits!